Paul Goldschmidt is a talented first baseman baseball player whose skills have earned him, among many other honors, five All-Star appearances while twice finishing runner-up for the Most Valuable Player Award. Goldschmidt, who has been nicknamed Goldy, currently plays in the Major League Baseball for the Arizona Diamondbacks. Read on to find out more about his early beginnings, career statistics, earnings, and personal relationships. Paul Goldschmidt was born Paul Edward Goldschmidt to Kim and David Goldschmidt on September 10, 1987, in Wilmington, Delaware. He, however, grew up in a suburb of Houston, Texas called The Woodlands, where he attended Woodlands High School. For his college education, Goldschmidt opted to stay close to home and attend Texas State University where he would play for the school’s baseball program, the Texas State Bobcats. As a freshman, Goldschmidt showed signs of being the great player he is today. He took his time to learn the ropes before beginning to impress in his sophomore year and was named the Southland Conference hitter of the year. In 2009, as a Junior, Paul Goldschmidt retained the Southland Conference Hitter of the year title and was further named Southland Player of the Year while also being included in the third-team All-American. That year, he played a total of 57 games, managing a batting average of .352 with 18 home runs (HR) and 88 runs batted in (RBIs). Following his performance that year, Goldschmidt was selected in the eighth round of the 2009 MLB Draft by the Arizona Diamondbacks. He was however immediately sent to the Rookie League to play for the Missoula Osprey where he continued to impress his coaches, hitting .334 with 18 home runs and 62 RBIs in just the first half-season of his professional career. The following year, Goldschmidt moved to the California League where he was named Most Valuable Player after being selected as an All-Star. He was further named Minor League Player of the Year by the Diamondbacks. In 2011, Paul Goldschmidt was renamed player of the year by the Diamondbacks. He further received honors such as Baseball America first-team Minor League All-Star, Double-A All-Star first baseman, Southern League All-Star first baseman, and MVP of the Southern League. He eventually got the call to play in the majors on August 1, 2011. In his rookie season, he played 48 games, managing a batting average of .250 with 8 home runs and 26 RBIs. The team went on to play in the 2011 National League Division Series playoffs where Goldschmidt hit a grand slam home run against the Milwaukee Brewers to become the third rookie to ever hit a grand slam in the postseason. In 2012, Goldschmidt played three times more the number of games he did in his rookie season. He batted .286 with 20 home runs, 82 runs, 82 RBIs, 43 doubles, and 18 stolen bases. He also managed his first two career regular season grand slams that season, each coming four days apart from the other. Till date, Paul Goldschmidt has continued to play for the Arizona Diamondbacks with who he has won different individual and team awards. Before catching the attention of major league coaches and turning professional, Paul Goldschmidt during his three-year-long college career, set records for home runs (36), doubles (45), walks (110) and RBI (369) at Texas State. He went on to become the first Texas State position player to play in the Major League. After being drafted and sent to the minor leagues by the Diamondbacks, Goldschmidt in overall, all through his two and a half minor league seasons, managed a batting average of .317 with a .407 on-base percentage and 83 home runs. So far, throughout his 8-year long major league career, Paul Goldschmidt has played 1013 games, managing a batting average of .296 with 193 home runs and 669 RBIs. In 2018, Paul Goldschmidt took home a base salary of $11 million having previously earned a base salary of $8.75 million and $5.75 million in 2017 and 2016 respectively. 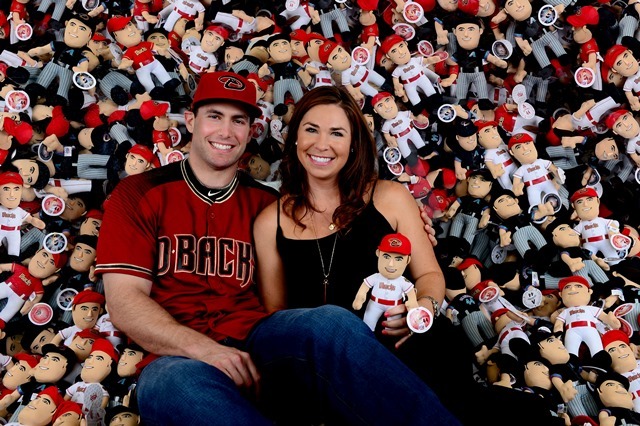 Paul Goldschmidt is married to Amy Goldschmidt whom he met as a freshman during his time in college. The couple got married in October 2010 and together have a son named Jake Goldschmidt who was born in September 2015. Paul Goldschmidt is of Jewish and European ancestry. Despite going pro and leaving college after three years, Goldschmidt later returned to the University of Phoenix where he graduated from with a Bachelor’s degree in management in 2013. He is an evangelical Christian. Goldschmidt’s awards and honors include being a 5-time All-Star (from 2013 to 2017), a 3-time Gold Glove Award and Silver Slugger Award recipient (both in 2013, 2015, 2017). Others are NL Hank Aaron Award (2013), NL home run leader (2013), and NL RBI leader (2013).